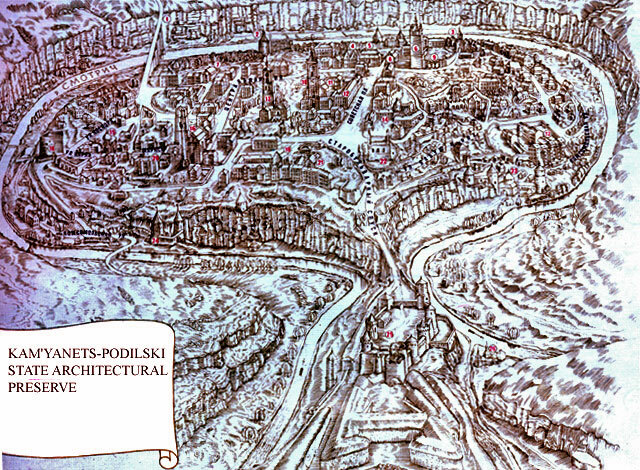 This bird's eye view of the old city is from the tourist map published by the Main Directorate of Geodesy and Cartography of the Council of Ministers of the USSR in Moscow in 1984. The numbers refer to the following architectural monuments. 2. Goncharnaya tower (1583) called Riznytska on all other diagrams. 6. Fortified tower and bell tower of the Armenian St Nicholas Cathedral (16th century). 10-11. Building complex of the Dominican monastery (14th - 18th centuries). 12. Building of the district court (1856). 13. City hall (rathus) with bell tower (16th-18th centuries). 14. Building of the former religious consistory (18th-19th centuries). 15. Church of St Peter and Paul 16th century, with bell tower (1834). Not to be confused with the much larger Cathedral of St Peter and Paul. 16. Complex containing the Cathedral of St Peter and Paul, (15th century), bell tower (16th-18th centuries), Triumphal arch (1781), and Turkish minaret (17th century). 18. Kushnirskaya tower (1565), and Vetryanii gate (16th century). 20. Building of the first Russian school (19th century). 21. Complex consisting of the Dominican convent (1720). St Michael chapel. 23. Russian gate (15th-16th centuries). 24. Polish gate (15th-16th centuries). 26. Church of the Exhaltation of the Cross (1799).